The Craftsman 2 X 42-inch belt sander is a very good general purpose belt sander. With its 1/2 HP motor it can handle most light duty work in the shop, including grinding lathe tools for both metal and wood lathes. This grinder allows for very fast belt changes, tracks well with a simple adjustment and has enough power to grind tools without overheating or bogging down. However, it does have two deficiencies that must be addressed before any serious grinding can be done on it — the main grinding table and the platen. The OEM table is made of cast aluminum. It pivots on and locks with a single large screw. Firm pressure on the table can overcome this screw and the table will move with the belt running, which is very dangerous. My advice is to dump it and build a decent table. The OEM platen is stamped mild steel. It is okay for light use like shaping Popsicle sticks but will not last long grinding lathe tools. 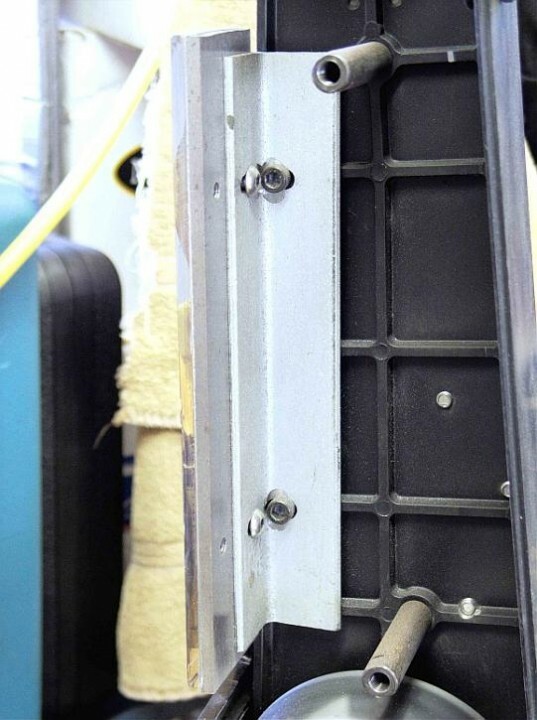 The platen is mounted solidly to the chassis and is fairly stiff but pressure on the belt will wear a divot into it quickly so basically it’s useless once this happens. Resolving these deficiencies isn’t difficult but it requires some fabrication. I’ll show you how I addressed them. A grinder platen has to be solid and unyielding, flat and ideally long wearing despite driving a grinding belt and grit over its surface. No steel platen I know of will withstand this kind of abuse for long but a ceramic glass liner will. This liner is actually a high temperature glass material originally developed by Corning and is commonly sold by knife making suppliers in 2-inch wide X 1/4-inch thick slabs of varying lengths. Commonly known as Pyroceram, it is usually mounted to a steel backing plate with JB Weld. This stuff is highly wear and heat resistant and only a full-time knife maker is likely to ever wear one out. If you do no other mods to your grinder at least do this one. I used a 2-inch wide X 9-inch long X 1/4-inch thick piece of O-1 precision ground steel as a platen/backing plate because I wanted a flat mounting surface that would not move with heat over time. I know that mild steel can move with localized heat and while this may not break the epoxy bond … it might. So far, I have had no separation issues so this worked for me. I drilled and tapped two 1/4-20 holes on each edge so the platen can be flipped over if the liner ever wears on one end. 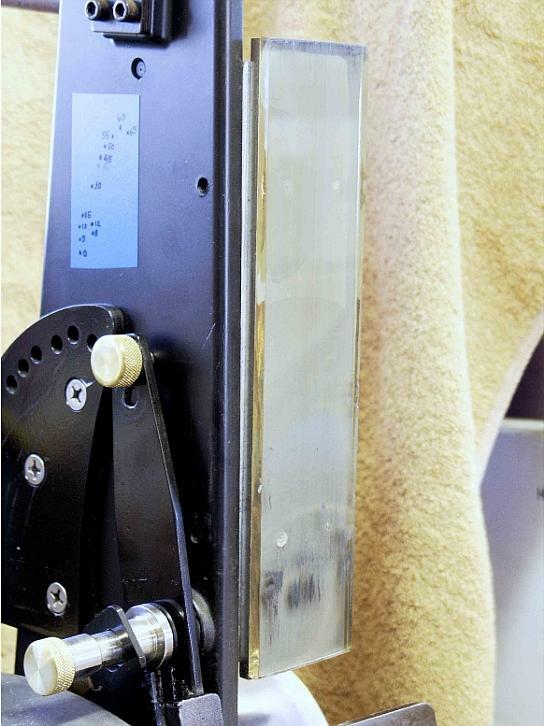 A piece of 1/8-inch thick X 1.5-inch wide angle iron (not aluminum) is used to attach this backing piece to the side of the chassis using the OEM screws and platen mounting holes. 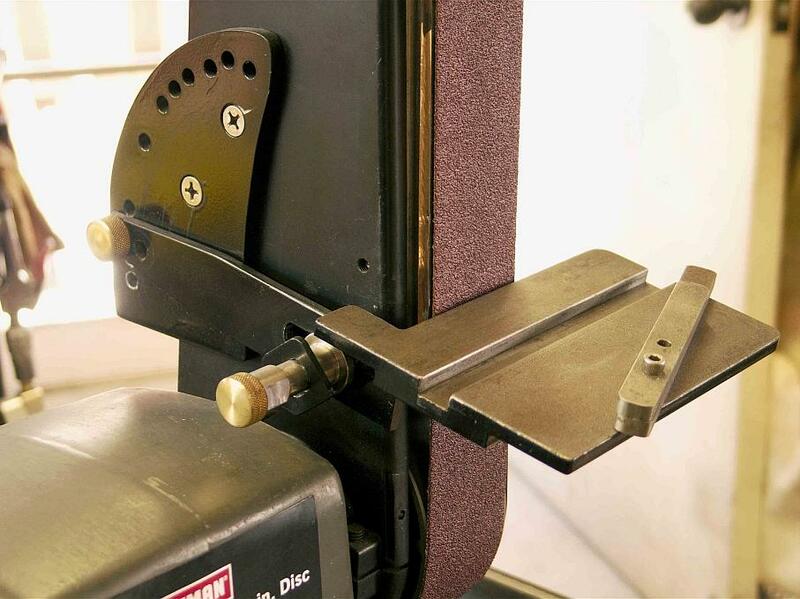 The mounting holes in the angle iron are slotted to allow squaring of the platen to the belt. Offset your platen and chassis screws if you copy this; the way I did it works but it would be better if the screws were clear of each other. Before attaching the liner to the platen, be sure to lightly bevel or round the side edges of the liner and more generously round the top and bottom edges to prevent cutting the belt. This is best done on a slack 50-60 grit belt. The sparks will be orange and the glass will glow but it grinds easily enough. I also lightly sanded the side of the glass that would bed in epoxy using sandpaper overlying some plate glass to give the glass some tooth. I put some oil on the tip of some 1/4-inch screws and use nuts to lock them down with their ends just flush with the epoxy side of the steel platen. This is to keep the holes clear of epoxy. After cleaning both contact surfaces with lacquer thinner, a 2 X 9 X 1/4-inch piece of Pyroceram is bedded onto the face of the platen with an even layer of JB Weld. I covered the face of the glass with a thin piece of plywood and clamped it with 4 spring clamps and allowed it to dry for a full 24 hours. JB Weld has the highest heat tolerance of any commonly available epoxy, at least to my knowledge. Ideally, you want to have a ledge under the glass liner to keep it from being knocked loose but mine has been stable for many years without a ledge. Be sure to use blue Loc-Tite to attach the platen to the grinder chassis so it won’t vibrate loose but can be easily removed if needed. In use, the Pyroceram platen is used like any other platen. Since it is glass you should avoid slamming hard objects into it but otherwise it is tougher than nails. I have ground hardened steels, tools, and other assorted materials and have yet to see any indication of wear or movement over the years, though the picture shows some transfer of paint from the back of the belt. Pyroceram is some truly amazing stuff. The piece I used cost $20.00, delivered!